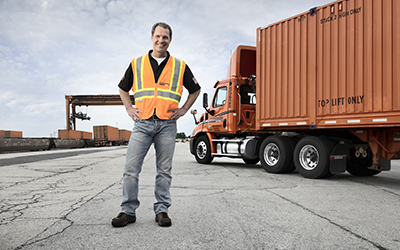 ﻿ What is life like as a Schneider Intermodal driver? What is life like as a Schneider Intermodal driver? Looking for a career in trucking that allows you to put family first? Becoming an Intermodal driver with Schneider may be the right career for you. Regional Intermodal drivers get home at least once a week (some daily), and local drivers return home every day, and both offer competitive pay packages. In addition to regular home time, Intermodal drivers enjoy options when it comes to work schedules. Choose to work Monday-Friday or Friday-Tuesday, so you have a schedule that works for you. Kevin found that Intermodal driving with Schneider allowed him to continue to be a part of the bakery he owns with his wife. Schneider has a large, steady freight base to keep you consistently busy, and staying busy means you’ll be bringing in more money. You’ll also be able to earn points and redeem prizes through the Pace Setter Recognition and Rewards Program. It’s how Schneider rewards drivers who consistently go the extra mile and achieve exceptional results. Schneider ensures drivers have thorough training and support to perform their job safely and efficiently. With paid training at two training centers for Intermodal drivers in Chicago and Los Angeles, two of the busiest railroad cities in the United States, Schneider makes sure you’ll be a safe and successful part of our team. You can also get a glimpse of one of our largest markets with behind the scenes video as a Schneider Chicago Intermodal driver. Want to learn more about Intermodal? Interested in becoming an Intermodal driver with Schneider? Apply now! If you’re an Intermodal driver, what do you love about hauling freight between rail yards? If you’re thinking about becoming a Schneider Intermodal driver, what else would you like to know?